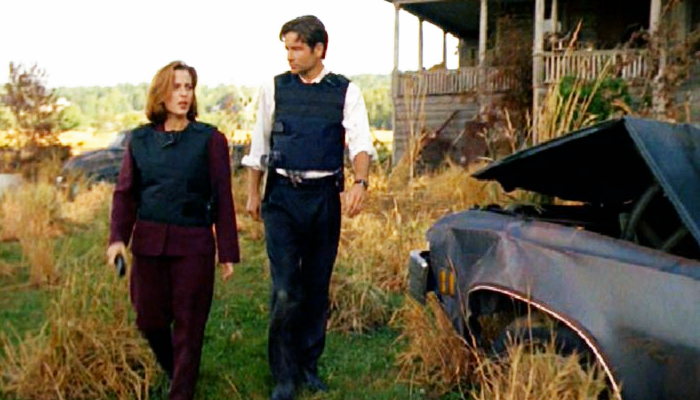 Mulder and Scully investigate a series of deaths, where the culprit is a family living in a decrepit house on the outskirts of a small town. Probing deeper into the suspect's story reveals a long history of inbreeding and degraded genetics that have created a lineage of human-wolf hybrids. Home was an unexpected sad episode from the combination of tragedy and captivity that forces this family to live in isolation but also feeding on unsuspecting strangers. 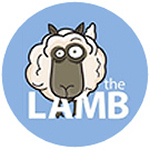 The children keep to the farm and go hunting every nightfall or so, while the mother (without limbs) is strapped inside the house losing her mind. Left with image of a family torn by poverty and genetics gave us a different very human and out-of-the-box idea of what's possible. This was truly insane! Several women's bodies turned up with their causes of death rooting from botched lobotomies. From a salvaged photograph one of the victims looks as if she is being pulled away into the abyss by a group of masked men. These photographs have the ability to predict the victims' fates, and the predator's issues showing what was going on in his mind. The killer rounds up his victims who he believes is suffering from anxiety and delivers lobotomies to release the bad spirits dwelling within their minds. Far from a "typical" kidnapping episode that we see in many crime and order shows, I liked the little ways in which it naturally capitalized on our fears, such as the use of a dentists' chair. 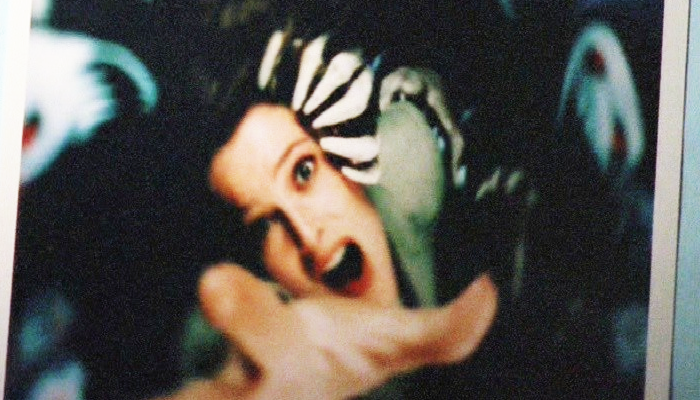 Scully's abduction scene and her trying to calm down the killer generated some true terror. 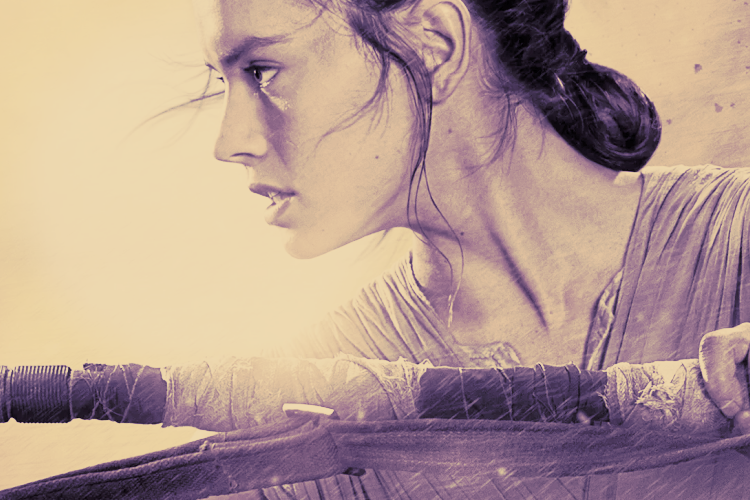 Even though she was kidnapped, it wasn't a particularly violent episode but suspenseful and terrifying. At a Chicago hospital multiple doctors begin exhibiting violent behaviors during plastic surgeries; the evidence of which is linked to a nurses' practices as a witch. I couldn't even refresh my memory about this episode by watching the promo. OMG, this was so disgusting. SO DISGUSTING. 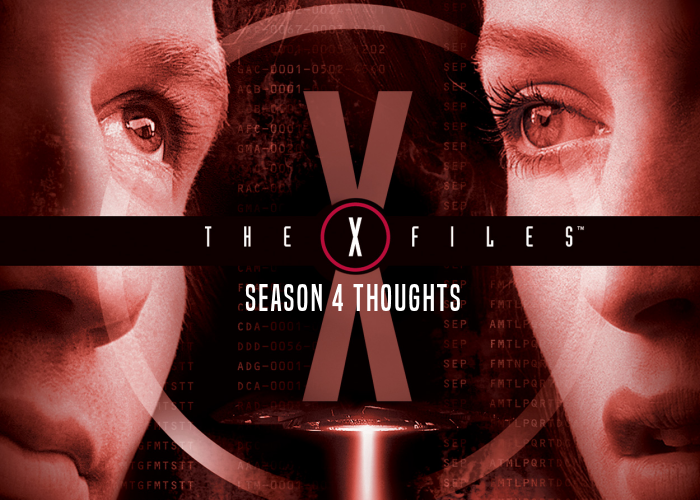 The X-Files is often criticized for its musings on phenomena without any true clear answers or solutions to the agents' cases. 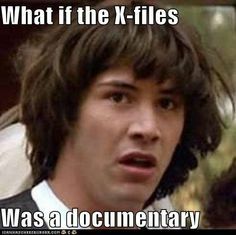 I like to think of the show more as an exploration of what we as the viewers think the truth is depending on what type of situation Mulder and Scully confront with their investigations. It all really comes down to what we believe. 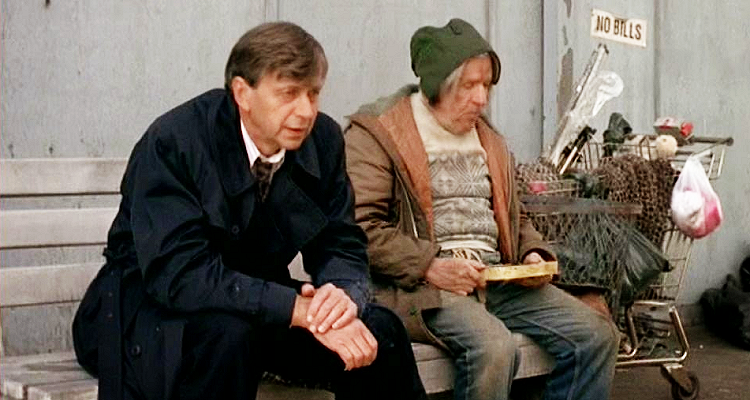 One of my favorite examples of this is the Musings of a Cigarette Smoking Man. There's a history to this shadow that lurks over our protagonists' shoulders, and this episode explores what may or may not be the Cancer Man's real past. Having a hand in the assassinations of John F. Kennedy, Martin Luther King Jr. and Malcom X is just the tip of the iceberg. The government is capable of many evils; a smallpox cover-up involving testing with alien and human DNA is one of many. The evidence uncovered by Mulder and Scully reveal details about her own abduction and cancer diagnosis to mass experimentation by World War II doctors on 'small-pox' patients. Throughout Tunguska and Terma, we see the further reaches of Cancer Man and the world powers that be as innocent bystanders are kidnapped and tortured in the furthest depths of Russia. One of the victims being Mulder himself involved in one of the scariest cliffhangers of all- trapped in gulag and splattered with black oil vaccine that swarms into his eyes and nose. EEK! Paper Hearts proves how long and arduous Mulder's journey is. When an old case centered on the kidnapping of little girls is reopened, Mulder is taunted that one of the victims may be his sister. 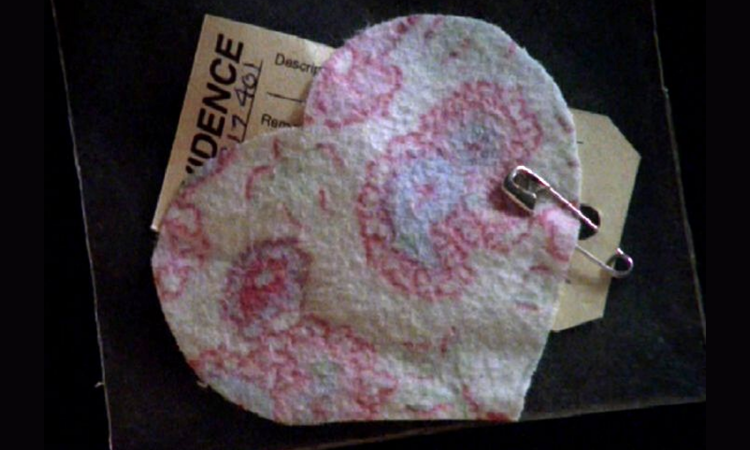 (The title of the episode comes from the cases' evidence of little hearts being cut out of the victims' nightgowns). By Mulder's fascination into the supernatural and unexplained phenomena, our initial instincts lead us to believe that Samantha was abducted by aliens, but as Mulder deals once again with a mass kidnapper and killer, the hard evidence makes us think that her disappearance could be by the hands of a human. Even if many episodes weave the same common thread of Mulder's quest, this is another fine, emotional story that makes us question if we are never going to know the truth. There's so many twists and turns to his discoveries, it's difficult to imagine the rollercoaster of emotions, lost and regained hope, he experiences throughout the series. In Never Again, while Mulder stays behind in his apartment doing Mulderish things, Scully takes a chance to live a little by going on a date with a man whose tattoo of a pin-up gal tries to control his emotions and actions. Rarely do we get a behind-the-scenes look at Scully and Mulder's life outside of their work. Scully always express skepticism to Mulder's extraordinary claims, and also a sense that she wants more than her life to be about the X-Files as passionate as she is about their cases. Sometimes she even goes as far as to make up excuses or vacations so she can get the weekend off and relax a little. I don't think this episode is out of character necessarily for what Scully does but for the interesting, if not quirky, experience she has just trying to be normal. I also love this episode because it does shine a spotlight on how self-centered Mulder could be; thinking that all of Scully's life revolves around him and his X-Files. While she sees their work as a pair, sometimes his tunnel vision could feel so superior as well as insufferable. 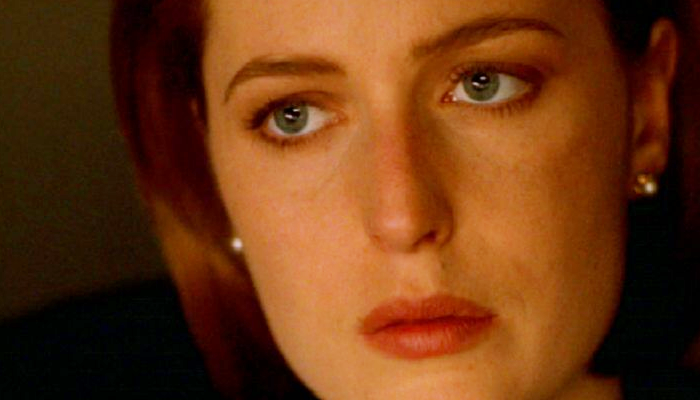 Scully's questions about her abduction comes to light in a tragic and heartbreaking reveal: she has an inoperable brain tumor. 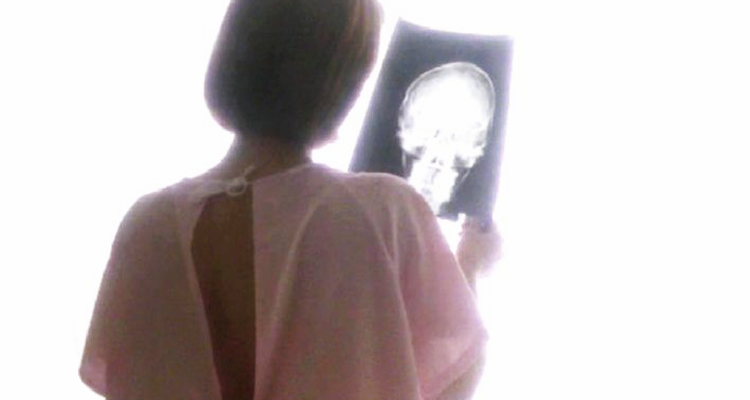 Left reeling with the diagnosis, Scully tries to pursue more scientific methods of approaching a cure while Mulder departs on an expedition believing her cancer and previous abduction are connected. So much of Memento Mori is heartbreaking as a character and a fan. It's a beautiful beginning to Scully coming to terms with her own mortality as well as her faith, which is often complicated by her work and underlying beliefs of what science offers to their investigations. It was also an unbelievably clever breakthrough. Given that Gillian Anderson was pregnant in the first season, and the showrunners needed a reason to give her maternity leave, Scully's brief departure was made possible via her characters' abduction; a storyline that exploded so many creative avenues for Scully and Mulder's cases as well as deepening Scully's evolution as a complex character. Scully: For the first time I feel time like a heartbeat, the seconds pumping in my breast like a reckoning; the numerous mysteries that once seemed so distant and unreal threating clarity in the presence of a truth entertained not in youth, but only in its passage. I feel these words as if their meaning were weight being lifted from me. Knowing that you will read them and share my burden as I have come to trust no other. That you should know my heart, look into it, finding there the memory and experience that belong to you, that are you is a comfort to me now as I feel the tethers loose and the prospects darken for the continuance of a journey that began not so long ago and which began again with a faith shaken and strengthened by your convictions if not for which I might never have been so strong now, as I cross to face you and look at you incomplete, hoping that you will forgive me for not making the rest of the journey with you. 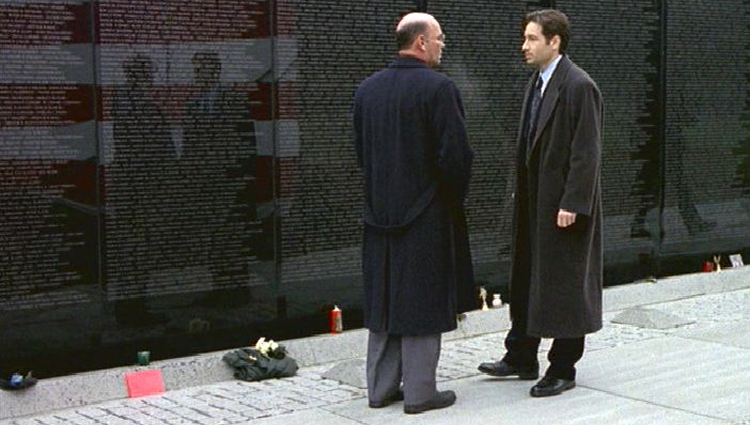 As the FBI covers as Major General Benjamin Bloch gives a speech to Vietnam War veterans, Mulder is convinced that a planned attack will take place. The shooter though, is a Vietnam War veteran, holding his superiors responsible for what happened to his comrads. The only issue with catching the supposed gunman is his ability to disappear what before their very eyes. Unrequited is such a good example of taking political issues and putting a supernatural twist to it. The episodes' writer Howard Gordon took inspiration from learning that soldiers can create blindspots while at war. The metaphors of men and women serving in war turning invisible is a great concept, and I like that it's used here for the aftermath of soldiers suffering from PTSD and the remnants of war. Zero Sum takes us a little bit further into the government's plot of alien colonization, vaccines, and experimentation. This time around bees are being used as a way to infect people with more alien DNA. Of course this really excited my inner History Buff because these types of experiments were committed during World War II when Hitler tried to master eugenics and create another black plague. 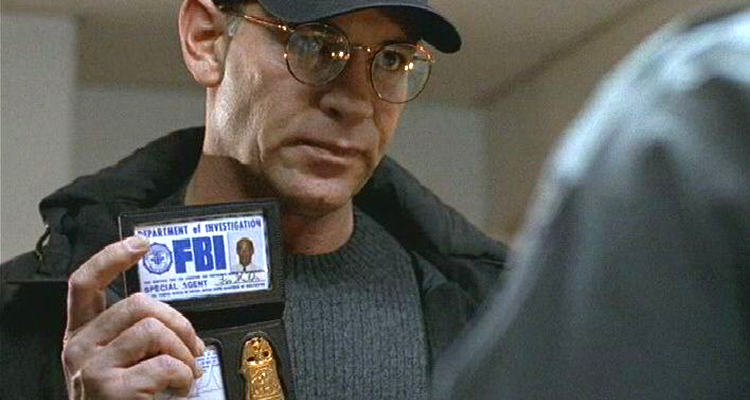 It also made me excited because it had more Skinner; a man with high morals and is very by the book who tries to do everything in his power to get a cure for Scully. Usually he plays a dubious yet supportive department head, sometimes acting like a surrogate father shaking his head in disapproval at his agents' escapades. It's great to see him here finally encountering some of the obstacles Mulder and Scully has faced when squaring off against the powers-that-be. Okay, so maybe this is my favorite season finale so far. 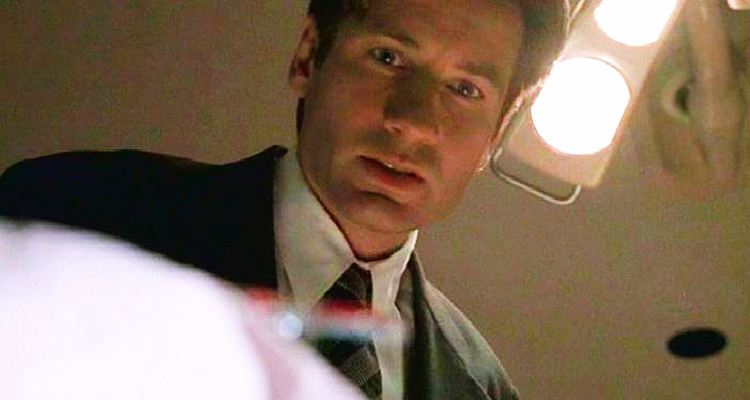 Approaching this season finale, Mulder reaches the end of his rope as his pentulimate belief in the truth has been levied by the government against him. As Scully stands alone to face a board of branch executives, she recounts the tale of what made Mulder seemingly commit suicide. When this originally premiered on television in 1997, I can't believe Chris Carter forced people to wait six months to find out what happened. Mulder's death, at the time, was probably an extremely unlikely possibility, but watching the episodes closer - how much he and Scully had endured and the amount of time his faith had been put to the test/questioned/mocked/, this really could've been an outcome of the show. 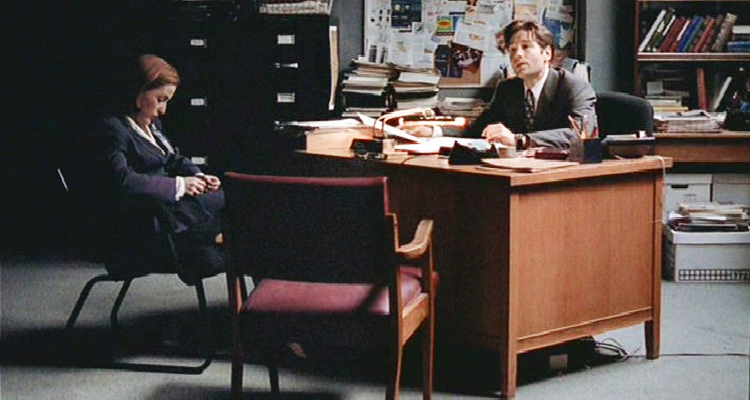 That aside, Duchovny and Anderson's performances are truly great. I'm not sure how they manage to keep getting better and better, but they truly do.